Located at the base of Spruce Peak at Stowe alpine village, the ski-in/ski-out Stowe Mountain Lodge offers more than 20,000 square feet dedicated to spa and wellness and has been named one of the "Top Ten Ski Resorts in North America" by Condé Nast Traveler. The AAA Four-Diamond Lodge is an invitation to luxury, leisure and appreciation for nature, providing a balanced itinerary of activities and spa relaxation year round. An on-site Alpine Concierge® is happy to help make arrangements for guests looking to spa, ski, fly fish or play a round on the championship golf course. 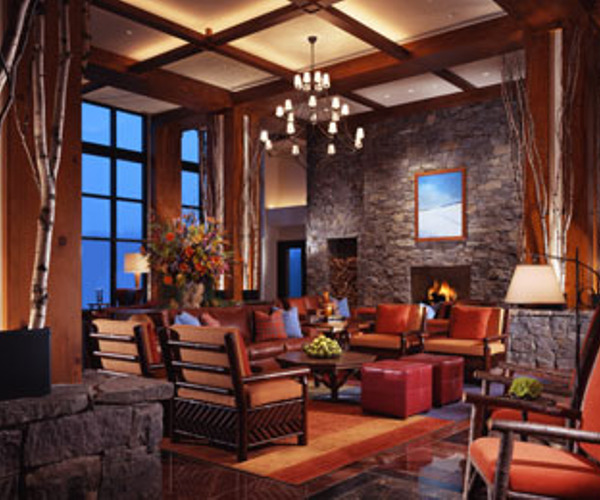 Indoors, the Lodge offers plenty to do après ski. The beautifully designed spa was created with earthy interiors and treatments that bring the outdoors in, and a designated children’s spa caters to the little ones. There is also artisan dining to try, cozy wood-burning fireplaces to curl up beside and tasteful accommodations in which to retire. The Spa and Wellness Center at Stowe Mountain Lodge features traditional spa therapies that integrate provincial influences, along with wellness offerings designed to help guests kick start healthier nutritional and fitness skills. Treatments include the 80-minute Sacred Journey, a combination of a mud wrap infused with lemon, bergamot, basil, nutmeg and cardamom, a full-body massage and hand, scalp and foot rituals. Spa interiors, fashioned in organic textures, platina copper, rustic wood and smooth stone accents and floor-to-ceiling windows, blend New England sophistication with the simplistic loveliness of the Green Mountains and the region’s ever-changing seasons. There are 18 treatment rooms, along with four hair and three mani/pedi stations, a full-service fitness center and relaxation lounge; the spa’s Healing Lodge comprises an herbal steam room, dry sauna, cooling rain shower and Jacuzzi. There is also a dedicated KidSpa, where children can enjoy services like the Chillax Session. 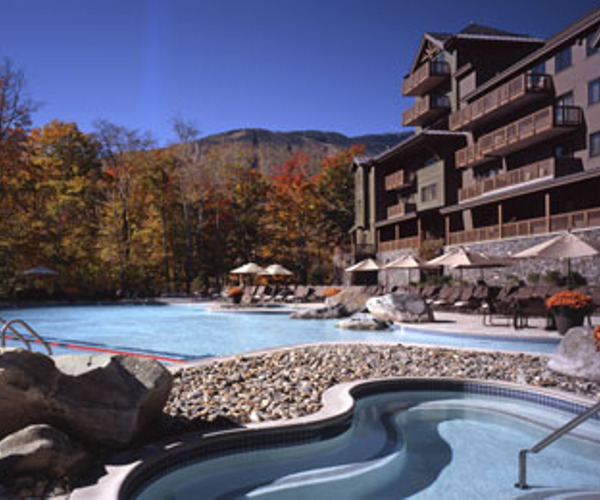 A resort for all seasons, the Stowe Mountain Lodge easily keeps guests engaged throughout their stay. The resort is adjacent to the Over Easy Transfer Gondola, connecting Spruce Peak to Mt. Mansfield, Vermont’s highest peak at 4,395 feet. Highlights for winter enthusiasts include 39 miles of skiing, with 116 beginner, intermediate and expert trails; a snowboarding half pipe; and nearly 50 miles of groomed terrain and backcountry trails for cross-country skiing. A full schedule of fitness classes get guests ready for a day outdoors or relax them upon return; offerings vary seasonally and include pre-ski stretch, athletic conditioning and gentle yoga. The resort is also within close distance of several warmer-season venues, including hiking and mountain biking trails, ponds and lakes for fly fishing and an 18-hole, par-72 championship golf course, designed by Bob Cupp. Additional features such as a 25-yard indoor/outdoor swimming pool, six tennis courts and kids’ comprehensive programming — Camp-Out Adventure, Circus Camp & Show and Tracking Where the Vermont Wild Things Are, among them — also keep guests entertained. Guests unwind in studios, junior suites or one-, two- and three-bedroom suites and two-, three- and four-bedroom club level accommodations; multi-level mountain cabin lodging, within close proximity of the ski-in/ski-out location and championship golf course, is also available and cater to families or groups. Rustic alpine aesthetic reigns, incorporating elements such as woven timbers, natural stone walls and floor-to-ceiling windows overlooking Mt. Mansfield and Spruce Peak. Rooms feature marble bathrooms, goose-down feather beds, wireless high-speed Internet access, LCD flat-screen TVs and, in many cases, stone-framed fireplaces, private balconies and kitchenettes. Dining at Stowe Mountain Lodge emphasizes a farm-to-table philosophy, with gourmet fare prepared with fresh, organic ingredients sourced from local farmers. Restaurants that tantalize guests’ taste buds include the AAA Four-Diamond Solstice Restaurant, and Hourglass bar and lounge, perfect for après ski signature cocktails and regional microbrews.